Failure to capitalize on its promising premise alongside a plethora of technical issues make Re-Legion's cyberpunk cult fantasy tough to recommend. Within the length of Re-Legion’s short tutorial, I saw protagonist Elion turn from corporate wage slave to a full on techno prophet. In the next mission, I already had a retinue and could freely convert people off the streets in droves within seconds. 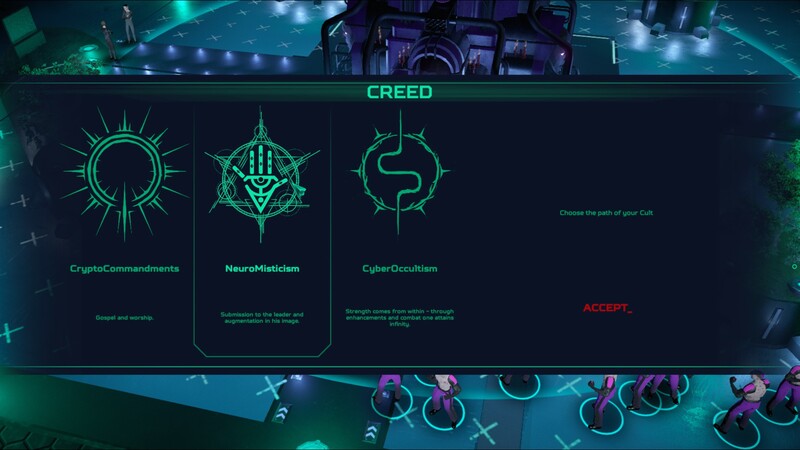 A so-called thought injection system lead people born outside corporations to live meaningless lives where they only sought to fulfill their basic needs; but while the premise of freeing them from their petty existence through cyber-spiritual enlightenment easily catches attention, Re-Legion stumbles too much to even get close to fully realizing its purpose as an RTS. Re-Legion’s concept could have easily set it apart. You’re a Cyberpunk prophet looking to topple the system by “awakening” people from their lives which are devoid of higher goals. Elion can convert others to his cause right off the bat. It’s a matter of right clicking and waiting for a few seconds while their Faith bar decreases, Elion even having an area of effect conversion ability which comes in handy with larger groups of people. Thus, you’re not relying on static buildings for recruits, being able to bolster your forces as you push through the map. You do end up capturing buildings, eventually, and they play two roles: some give you one of Re-Legion’s two resources, Credits and Faith, while the others provide upgrades and abilities to units. When you convert citizens they’re slow and weak. With the click of a button, however, you can turn them into a variety of more or less potent units, such as devoted, half naked fist fighters, sturdy monks, ranged troopers or silent assassins. But, while there’s a trickle of new units as you progress through the game’s story missions, wrestling with the way they control took a toll heavy enough that by the fifth mission I had had more than enough of it. Re-Legion is plagued by a plethora of bugs and strange design decisions. 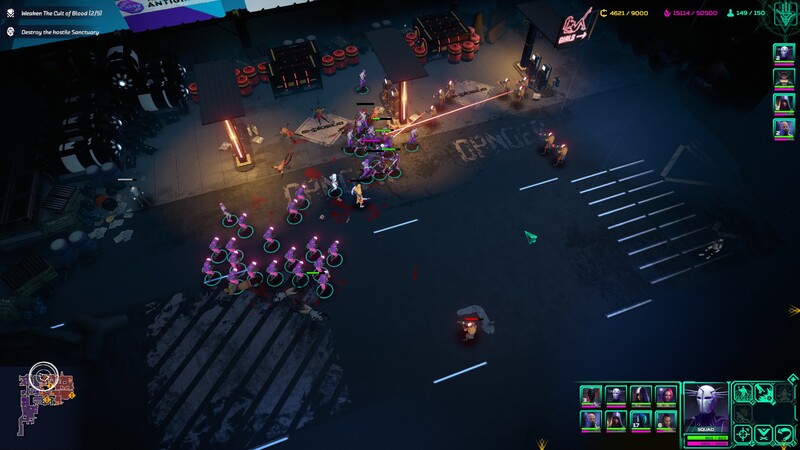 Although you start with just a handful of followers, you’ll eventually find yourself controlling a massive blob of units as you roam from sector to sector, capturing buildings in order to gain control of the map. That’s when you’ll notice how broken unit pathfinding is, alongside how unit and group selection makes a goal out of giving you a hard time. Since picking out individuals from a group is made difficult by how purple models blend into each other, I, naturally, tried relying on control groups. The problem was that both control groups and hero icons require pressing the assigned button twice in order to select them, for some reason, while also suffering from a few seconds delay before actually selecting the desired unit. One time, I managed to accidentally include a few units I didn’t want in one of my control groups. I expected shifting them to a second group would remove them from the first, but it didn’t, resulting in them confusedly moving between the different groups’ orders. Ordering units to move around is an unfortunate adventure on its own. I saw long conga lines of zealous warriors stretching across the map, most of them making it to their destination, while others ended up stuck in the environment. Often times, they simply chose to completely ignore enemies shooting at them on the way. When receiving an attack order, ranged units would run up to the enemies and do nothing, just like melee fighters would move way past their targets – even if they were part of a large group – and choose to admire the surroundings as their peers got slaughtered behind them. Some of the melee fighters would spaz out of control right before reaching their opponent and ,in the one defense mission I played, my units died a good number of times because of stubbornly insisting on pursuing the enemy outside of the friendly turret range. Sometimes, the act of selecting an enemy unit to attack was nigh on impossible, as the game didn’t register the enemy as such. I just had to move the blob in their proximity and hope that more than four units would fire. My Confessors, said to be deadly silent assassins, could use a handy cloaking spell that I thought would be useful for some sneaky infiltration. Everything was fine and dandy until, halfway to the enemy camp, my cloaked units spontaneously became unselectable. It’s pretty pointless to discuss the various unit abilities, given how much of a chore controlling and quickly jumping in between control groups is. I only ever used Elion’s mass conversion spell consistently, as it not only helped with recruiting new followers, but also with keeping their Faith bars filled. You see, with low Faith, units are susceptible to conversion by enemy Preachers. The problem here is that Elion’s ability has a cooldown and a rather small radius of effect, while the Worshippers, the other units able to bolster Faith, wouldn’t automatically refill my followers’ low Faith levels unless given individual orders. This is why certain combat engagements turned into instant losses, which prompted navigating laggy menus to reload the game several times. Saving isn’t much better either, sometimes taking its sweet time, even when installed on an SSD. Re-Legion’s combat feels like an uneven, botched experiment. Most units fall shortly after the engagement begins, aside from a few that are rather resistant. It’s hard to make sense of who’s attacking what exactly, and the speed at which troops die, alongside the game’s controls, removes any possibility of viable tactical play, aside from moving blobs across the map and hoping for the best. Certainly, there are three directions you can nudge your cult towards at the beginning of the campaign, but although I kept gaining new dogmas, I saw no tangible change in the behavior or power of my units. Lastly, the game has a fondness for crashing, whether randomly during combat or when trying to load a save. 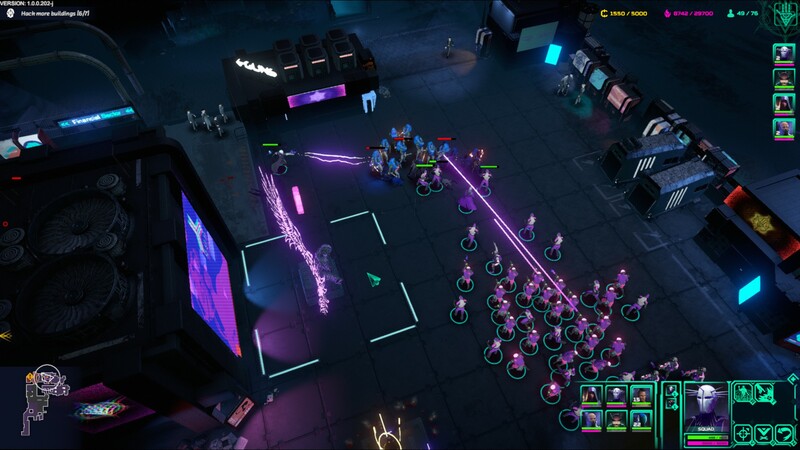 Re-Legion’s constant use of purple neon hues does act as a reminder that you’re in a cyberpunk dystopia of sorts, but four missions in, I had seen enough of it. The game’s visuals never quite manage to mix properly either. The shiny glass helmets of ranged troopers constantly stood out like a sore thumb in a pile of purple uniforms. Their models are anything but detailed and during battles it’s hard to make out what’s happening when two blobs of units engage each other. The lackluster animations don’t do much to help things either and, generally, everything that’s not a loading screen or piece of artwork fails to impress. As serious as you’d maybe expect a quest of enlightening a dystopian city through religious fervor to be, Re-Legion’s campy B-movie level dialogues and writing fail to find a cohesive tone. Important events happen in an instant, without the necessary preparation. Moral choices pop up out of nowhere and lack the context required to give them any weight. I learned of the Fibonacci cult being “misused” seconds before I was asked about whether I wanted to offer protection or enslave them. I couldn’t tell you why I picked the first option. The voice acting on show varies wildly in quality, with mediocre being its highest point. It’s quite a convoluted mess. All these things compound into one of the least bearable RTS experiences I’ve encountered in a good while, which is why I gave up on Re-Legion five missions in. Instead of being significant moments to look forward to, gaining a new Dogma, power or unit type felt irrelevant, as the game’s many issues piled on top. From its control scheme, to the myriad of bugs and uninspired blob-versus-blob combat, Re-Legion misses all the marks required to be even a passable RTS worth playing when you’re particularly bored. Not only does it fail to capitalize on its promising premise, which is a terrible shame, it suffers from technical woes that impede getting any form of enjoyment out of it. Stay far away from this here cult.